Lovely 14k White or Yellow gold Celtic inspired cross pendant. Cross measures a large 48mm in length including the bail by 21mm across. The back of this cross is a textured design and it weighs 3.06grams. Cross is made in the United States. 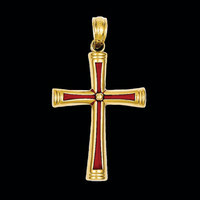 14k yellow gold with Red Acrylic accent creates this unique cross pendant. Cross measures 30mm top to bottom including bail and 17mm across. Pretty 14k yellow gold Fleur De Lis cross pendant. Lovely open scroll Fleur De Lis design features a textured and polish finish. Cross measures 36mm top to bottom by 19mm across. 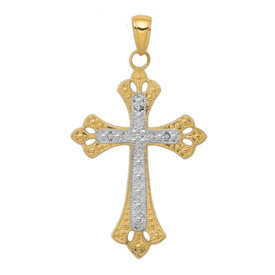 Pretty 14k yellow gold diamond cut beveled edge cross pendant. 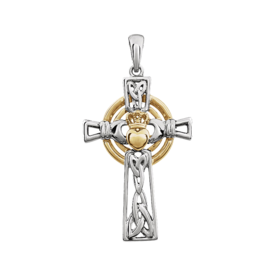 This delightful cross design is part of our passion cross collection. The points at the end of the Passion cross represent the suffering of Christ at his crucifixion. This cross measures 28mm in length by 12mm across. Pendant has a textured back and weighs 1.39grams. The diamond cut and beveled edge give this cross it's incredible sparkle. Stylish 14k yellow gold laser design cross pendant. This laser etched cross is available in a variety of sizes. Price shown is for 26mm length by 13mm wide. In our large cross category we have this cross in a large selection. Cross features a polished finish. Textured design 14k gold cross pendant is available in 14k white or yellow gold. We offer this cross design in 3 great sizes, a 20 x 13mm, 24 x 16mm, and large 30 x 20mm selection. This cross finish looks like bark or grooves from a timber, very symbolic design. Our price shown is for the 20mm cross. The bail on this cross has a 2.75mm opening. 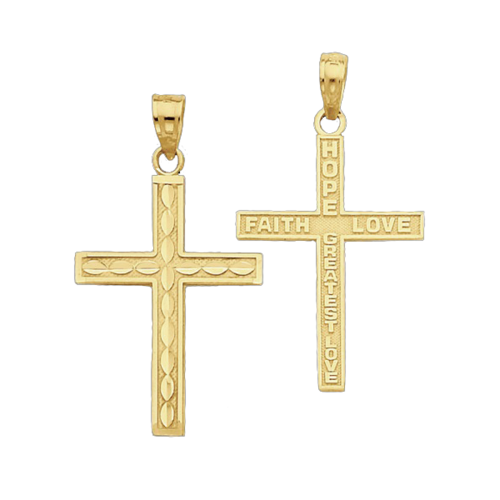 14k yellow gold reversible cross pendant. Great cross features a pattern and texture design on one side with words, Hope, Faith, Love, and Greatest Love, on the opposite side. Cross measures 31mm in length by 17mm across. 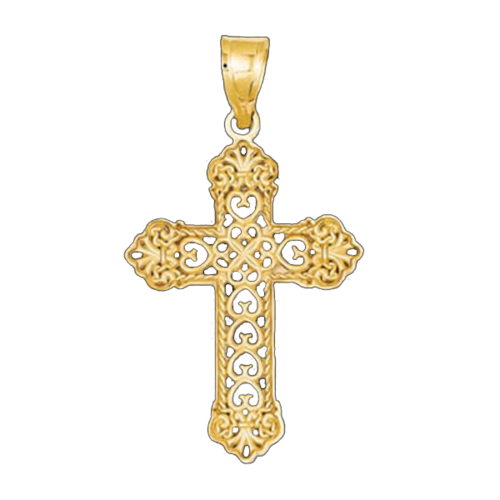 14k Gold filigree cross pendant. This simple filigree braid design measures 29mm in length by 14mm across. A nice simple yet stylish cross. Larger version also available. It measures 34mm in length by 19mm across. Pretty 14k two tone gold cross pendant. This fancy design features rhodium for the white accents and diamond cut accent for added style. The back of this cross is textured. Measures 41mm in length including the bail by 23mm across. Finely crafted 14k gold large cross pendant. Cross features a diamond cut satin finish and measures 38mm in length by 24mm across. Add the bail for a length of 47mm, almost 2 inches. This design is part of the Latin cross collection, one of the oldest forms of the cross, thought of as the true form of the cross. Cross weighs 3.2grams. This cross is solid gold. A handsome symbol of your daily faith. 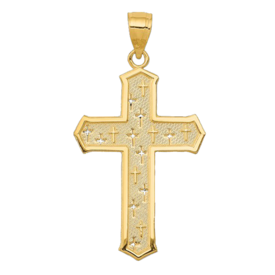 14k Yellow gold large hollow design cross pendant. This pretty cross features a polished finish and flat back but it hollow making it very affordable. It measures 45mm in length by 21mm wide. 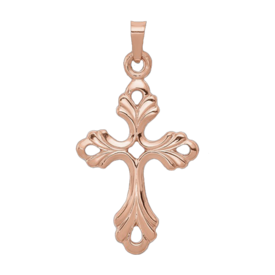 Fancy 14k Rose gold Fleur de lis design cross pendant. This cross measures 35mm in length including the bail by 17mm across. A delightful Fleur De Lis style cross pendant in the warm right rose gold. 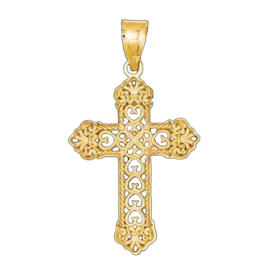 Pretty 14k gold filigree design cross pendant. This cross measures 30mm in length before the bail by 22mm across. Length including the bail is 37mm. A very pretty cross pendant. Pretty 14k gold rope design cross pendant. This cross pendant is available in 3 sizes starting with a dainty 13.5mm by 8.6mm. Metal choices include 14k Yellow, White, and Rose gold. Other cross sizes include 17.5mm and a large 32mm selection. A simple design with an "X" center. Charming 14k yellow gold Passion cross pendant. This great cross features cut out and embossed cross design in a satin and polished finish. Cross measures 28mm in length not including the bail by 18mm across and weighs 1.14grams. The points at the end of a passion cross represent the suffering of Christ on the cross. 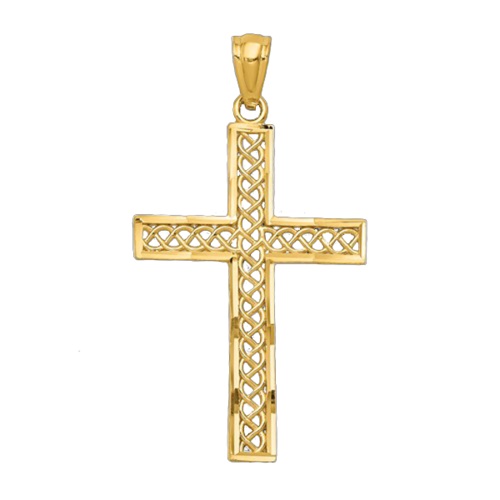 Pretty 14k yellow gold Budded cross pendant. This cross features a flat engravable back and measures 28mm in length by 15mm across. The front of this cross is polished and the back a lovely satin. 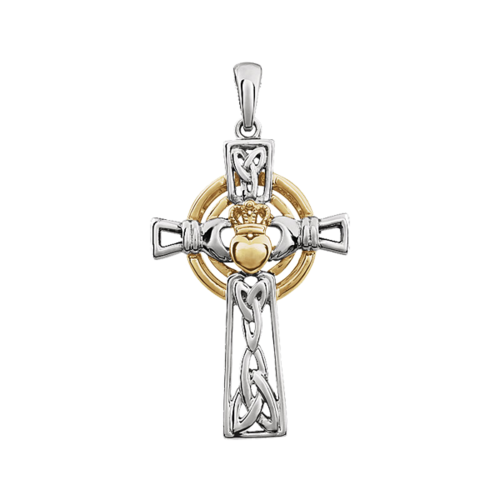 Symbolic 14k two tone gold Claddagh cross. This great design measures 34mm top to bottom by 19mm across and weighs 3.7grams. 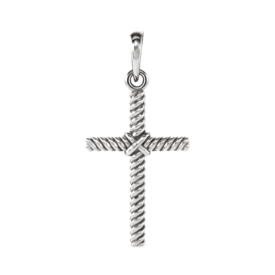 Cross is shown with a 14k white gold cable chain as a great addition. Alluring 14k yellow Filigree Greek key style small cross pendant. 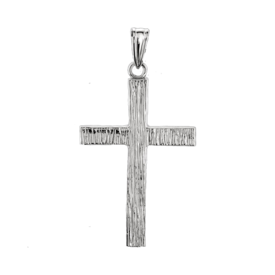 Indulge yourself with this delightful cross pendant measuring 25mm in length by 18mm across. With the bail this cross is 32mm in length. 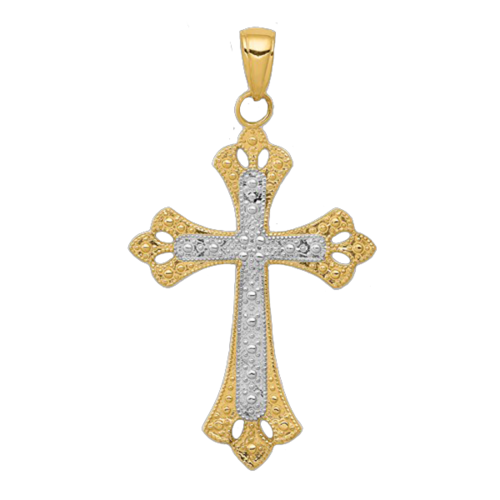 This cross weighs 1.61grams and diamond cutting gives it a flashy look. 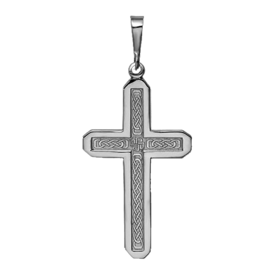 Cross features a combination of satin and polished finish cross and has an open back. 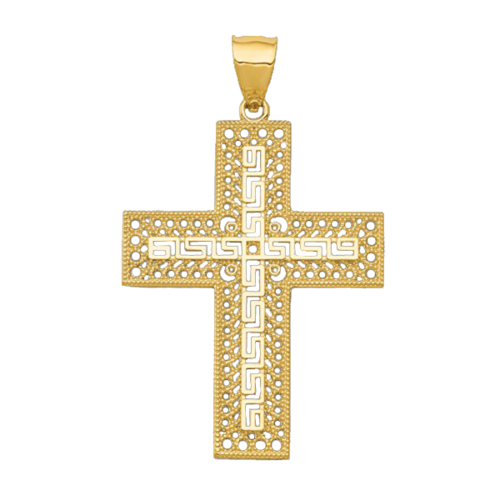 The inner cross is a Greek key design with a filigree border. 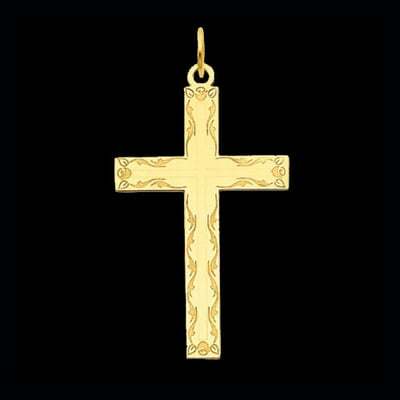 Jumbo 14k Gold large cross pendant. This cross features a textured background slightly recessed with polished parallel lines forming a cross center design. Border of cross is polished. This cross measures an incredible 56mm in length 66mm including the bail. Cross is 38mm across and weighs a fantastic 12.9grams. This cross features a flat back. Order in 14k yellow or white gold. You'll love this handsome large gold cross. A person's style expresses his/her worldview and whole being, as formed by individual cultural beliefs and traditions. For this, we have jewelry specially handcrafted for people of faith. Gracious Rose offers a collection of cross pendant jewelry for deeply religious people seeking beautiful representations of their faith. Expressing faith in public was not always allowed. Believing that Jesus' teachings inspired rebellion against the Empire, the Roman Army imposed a crackdown on all followers of Jesus, hunting down his disciples and killing them. Early Christians were persecuted, and many were forced into hiding to secretly worship their God. With many concealing their faith to avoid arrest, Christians had to find a way to express their spirituality and unite with their fellow Christians. Specialized jewelry crafted in the symbols of their faith was one of the solutions, wearing cross pendants to signify allegiance to the Christian faith. The Roman Catholic Church eventually embraced this practice, and religious jewelry quickly became popular among Catholics. The Church and its doctrines became the inspiration for necklaces, bracelets, rings, and pins. Today, cross pendants remain in fashion and are worn on various occasions. This kind of religious jewelry is typically chosen as gifts for men. They can be given to fathers, brothers, uncles, or grandfathers deeply connected to the Catholic faith. 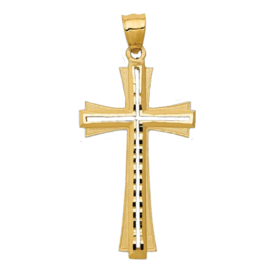 Men's jewelry accented with cross pendants can be worn with any attire, and lends a spiritual vibe to a person's style. Ichthys. Resembling the profile of a fish, the Ichthys Cross is made of two intersecting arcs. Anchor. It also called a Mariner's Cross. The Crucifixion of Jesus. This features an image of Jesus on the cross. Latin Cross. This cross is characterized by having two bars, a shorter, horizontal one crossing over the longer, vertical bar. Celtic Cross. This cross has a circle around the crossbar to represent the sun, which the Irish used to worship before Christ. Calvary Cross. This symbol has three steps leading to the cross to refer to the calvary. 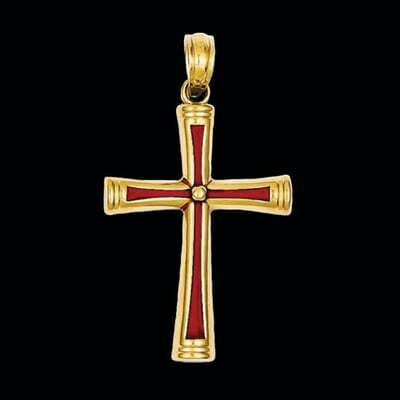 With such rich symbolisms, a cross pendant is a precious gift that your loved one will appreciate. Cross pendants by Gracious Rose come in silver, gold, and platinum, with some featuring the brightest stones and gems. 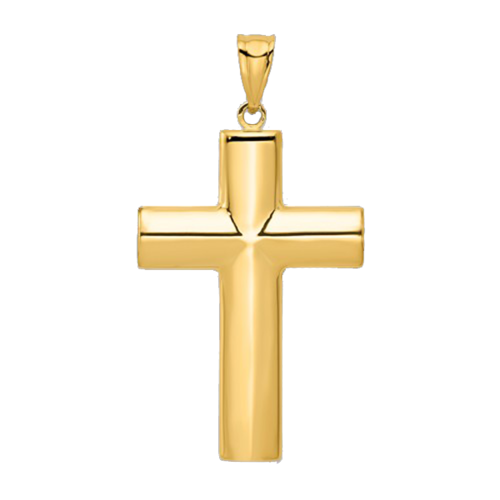 For classic jewelry, choose a gold cross pendant. They perfectly compliment any skin tone and suit all genders and ages. 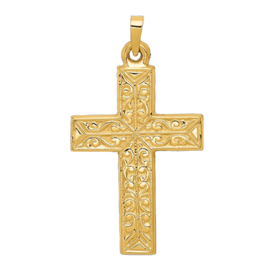 A gold cross pendant can be given as a christening gift, for a birthday or as a celebratory present. Cross pendants also come in different shapes and sizes. Large pendants are ideal for adults, especially men, and are eye-catching accents that say something about a person's faith. Meanwhile, small pendants are perfect for children and babies to wear as a stylish amulet. Pendants by Gracious Rose can be engraved or studded with diamonds and other gems. Our selection of uniquely designed cross pendants is available online, along with the rest of our 3,500-piece jewelry collection. Let beautiful jewelry show off your faith. 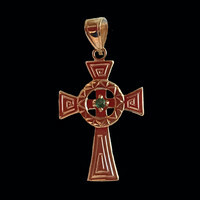 Choose a gold cross pendant from GraciousRose.com. Get free shipping on orders over $250!